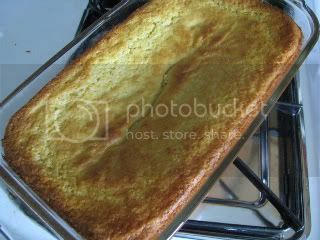 Looking for something a bit different from "regular" cornbread, I searched online for a recipe for cornbread that was baked in a loaf pan. Although I had a yeast bread in mind, I found one that's leavened only with baking powder. The recipe I found was like this one, except that it allowed for vegetable oil to be substituted for melted butter. I used canola oil, although I'm guessing the bread would taste better with butter. In mixing bowl, mix together all dry ingredients. In a small bowl, beat eggs; add milk and melted butter. Add liquid to dry ingredients, mixing just until blended. Pour into greased 8 1/2 x 4 - 1/2 x 2 - 1/2 inch loaf pan. Bake in 350 degree oven for 40 to 45 minutes or until golden brown and tester inserted in the center comes out clean. Cool for 5 minutes in the pan, then turn out onto rack. Serve warm with butter. As it turned out, I had the oven on to bake cookies, so I baked the bread in the oven. I have a yeast cornbread that uses molasses if you are interested - great with chili and such. We love cornbread, but I've never thought of making it in a loaf. Thank you for the recipe and the great idea! This sounds so simple and delicious. I will definitely be trying it!